5-room house, detached, for 8 people, 150 m2 on 3 levels.Living room with satellite-TV, DVD, video, radio, hi-fi system, CD player, open fireplace and dining-table. Smoking not allowed.Sleeping room with 2 single beds. Sleeping room with 2 single beds. Sleeping room with 2 single beds. Sleeping room with 2 single beds.Open kitchen with 4 hot plates, micro wave, oven, grill, dining table, dishwasher and fridge. Food service: breakfast (extra), bread roll service (extra), full board (extra), half-board (extra).Bath/shower/WC.Balcony, terrace, terrace furniture, box-room.Other equipment: children's highchair, hair dryer, iron, whirlpool. 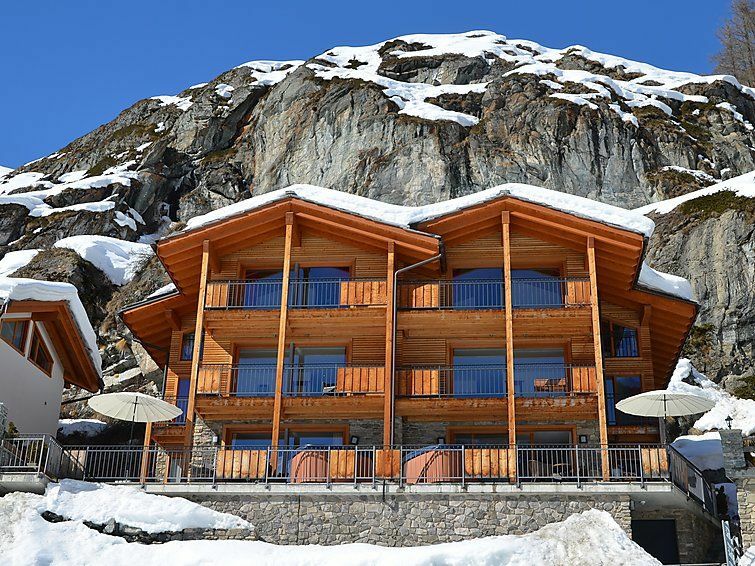 New, large, luxurious chalet Chalet Castor, built in 2008, surrounded by meadows.House Equipment: whirlpool, washing machine (shared use), tumble dryer (shared use).Access & Parking: no parking possible. Footpath, stepped path with 35 steps. Situation: on the outskirts of Zermatt, in the district of Oberdorf, quiet, elevated, sunny position in the countryside, on a slope. View from the apartment of the mountains, the resort and the countryside.Surroundings of the house: grounds (shared use).Facilities and distances: tennis 350 m, tennis club 350 m, ski lift 200 m, ski school 350 m, ice rink 350 m, mountain lift 200 m.